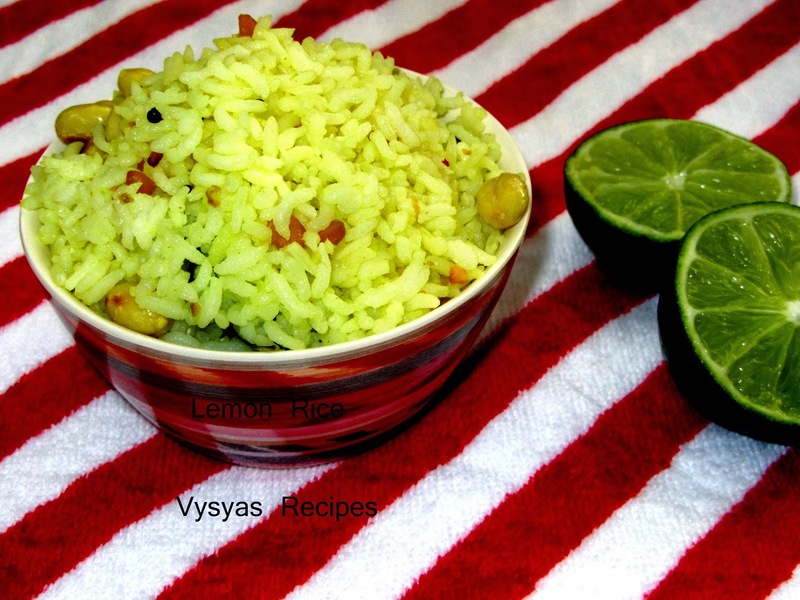 Lemon rice is one of the Popular Variety Rice in South India. It is a Simple Lunch box recipe. Tangy Lemon juice when Mixed with Seasoning and Rice tastes awesome. 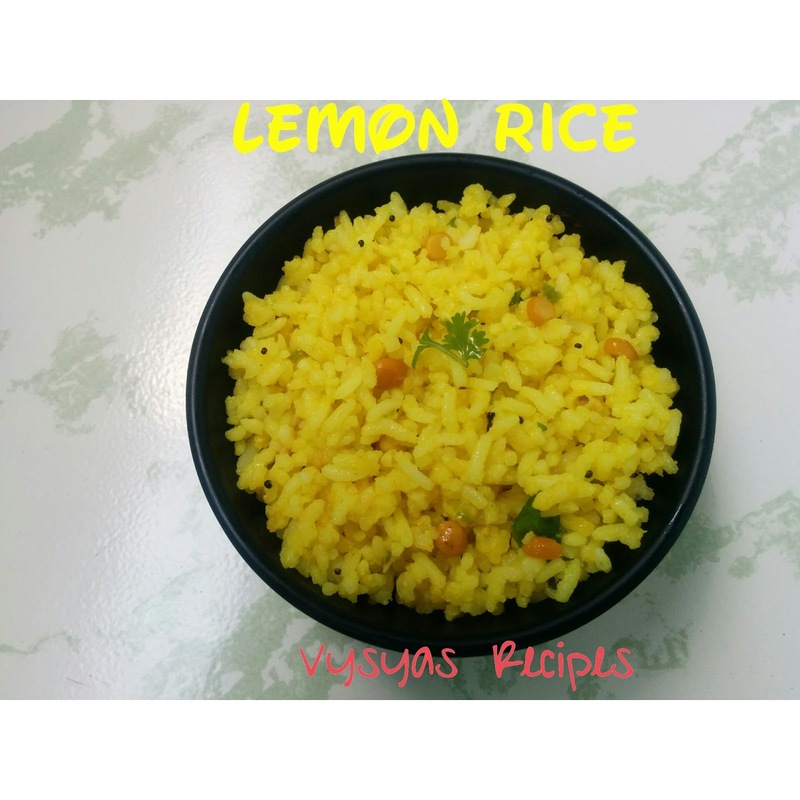 Lemon Rice is traditionally made during festival occasions like Navaratri and Ugadi. It is also offered as Prasadam in many temples. Lemons are rich in vitamin C and flavonoids that work against infections like the flu and colds.The citric acid in lemon juice helps to dissolve gallstones, calcium deposits, and kidney stones.Ayurveda medicine values the lemon as a fruit and for its properties. It is sour, warm, promoter of gastric fire, light, good for vision, pungent and astringent.Now we learn to make healthy tasty Lemon rice. Rice - 1 cup (or) cooked rice/left over rice: 3 cups. oil - 2 tbsp [Preferably Sesame oil]. Cook 1 cup of rice with 3 cups of water for 3 whistles. When pressure subsides place it over a wide vessel or plate and drizzle 1 tsp of sesame oil over it.Allow it to cool completely. So you get separate rice.This is the important step while making Variety rice. Squeeze the lemon in a bowl and keep it aside. Roast the peanuts and remove its skin. Heat the oil, add mustard seeds, when it splutters, add urad dal, chanadal, Red chillies, Green chillies, curry leaves, Ginger. Saute till dals turns golden brown. Add Roasted peanuts, hing, turmeric.Give a quick stir and switch off the flame. Then add cooked rice, Mix well. Give the standing time of atleast half - an - hour. So that everything will get incorporated and gives good taste. Lemon rice tastes Great with left over rice also. Adjust the quantity of lemon as per your taste. here are many health benefits of lemons that have been known for centuries. The two biggest are lemons’ strong antibacterial, antiviral, and immune-boosting powers and their use as a weight loss aid because lemon juice is a digestive aid and liver cleanser. Lemons contain many substances--notably citric acid, calcium, magnesium, vitamin C, bioflavonoids, pectin, and limonene--that promote immunity and fight infection. Perfect for kids...... Love it!! Delicious & awesome looking rice..........loved it.